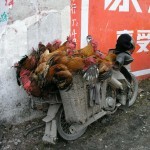 Quite a few of my recipes have escaped out onto the Web. You can find a selection on the UK Food website. The following recipe, for Gong Bao chicken, is one of my favourites and a Sichuanese classic. I cooked it recently in the Taste of China tent at the Taste Festival in London (one of the assistants there said it was the most delicious dish he had tasted the whole weekend! ), and it has also been featured by NPR’s All Things Considered. I’ll try to fix a photograph of the finished dish and post it here soon. 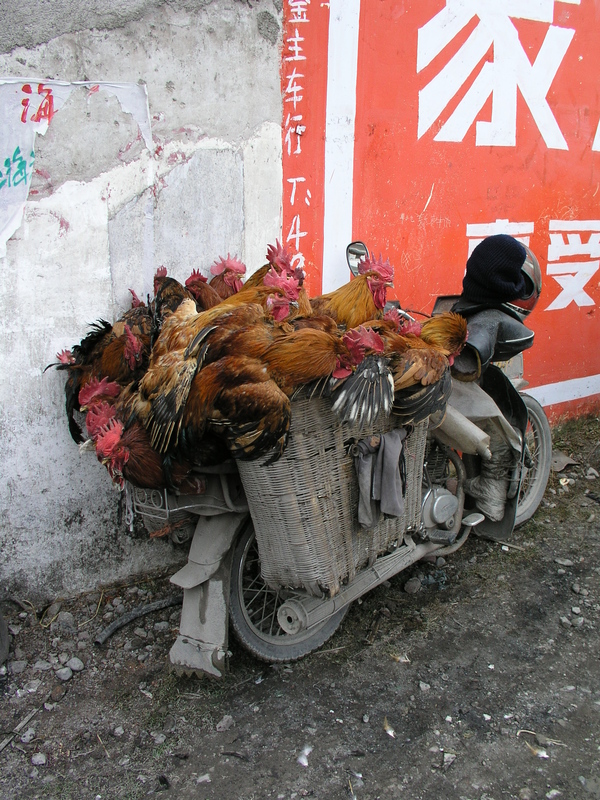 In the meantime, here’s a nice picture of some chickens on the back of a motorbike in rural Sichuan. This dish, also known as Kung Pao chicken, has the curious distinction of having been labelled as politically incorrect during the Cultural Revolution. It is named after a late Qing Dynasty (late nineteenth-century) governor of Sichuan, Ding Baozhen, who is said to have particularly enjoyed eating it – gong bao was his official title. This association with an Imperial bureaucrat was enough to provoke the wrath of the Cultural Revolution radicals, and it was renamed ‘fast-fried chicken cubes’ (hong bao ji ding) or ‘chicken cubes with seared chillies’ (hu la ji ding) until its political rehabilitation in the 1980s. Cut the chicken as evenly as possible into 1cm strips and then into small cubes. Mix with the marinade ingredients. Peel and thinly slice the garlic and ginger, and chop the spring onions into Icm (1/2 inch) chunks. Snip the chillies into 1.5cm (3/4 inch) sections, discarding seeds as far as possible. Combine the sauce ingredients in a small bowl. Pour a little groundnut oil into the wok and heat until it smokes, swirling the oil around to cover the entire base of the wok. Pour off into a heatproof container. Add 3 tbsp fresh oil and heat over a high flame. When the oil is hot but not smoking, add the chillies and Sichuan pepper and stir-fry for a few seconds until they are fragrant (take care not to burn them). Add the chicken and continue to stir-fry. When the chicken cubes have separated, add the ginger, garlic and spring onions and stir-fry until they are fragrant and the meat is just cooked. Give the sauce a stir and add to the wok, continuing to stir and toss. As soon as the sauce has become thick and lustrous, add the peanuts, mix them in, and serve immediately.